Liquid Natural Gas tanker ship. A group of First Nations is fighting the Petronas-led Pacific NorthWest LNG project, marking the first time that aboriginals have outright opposed a liquefied natural gas proposal in British Columbia. Many aboriginal leaders have voiced their support in principle for B.C.’s fledgling LNG industry in the past, as long as the projects meet environmental standards to protect the land and water, but Pacific NorthWest LNG is facing criticism for choosing a site that critics say will harm juvenile salmon. 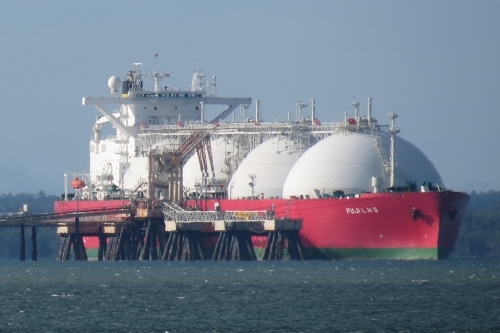 Leaders from the Wet’suwet’en, Gitanyow, Lake Babine and Gitxsan say Pacific NorthWest LNG’s proposed site at Lelu Island in northwestern British Columbia is the wrong place to locate an LNG export terminal. The First Nations leaders want the joint venture, led by Malaysia’s state-owned Petronas, to withdraw plans to build on Lelu Island because of fears that construction of an LNG terminal will damage eel-grass beds in Flora Bank, where young salmon swim after they hatch.